This simple, user-friendly e-book will walk you through a high-level modern feng shui consultation to transform your home in eight weeks. Not only wil the place where you live turn into a gorgeous home, your dreams will be supported by your design! 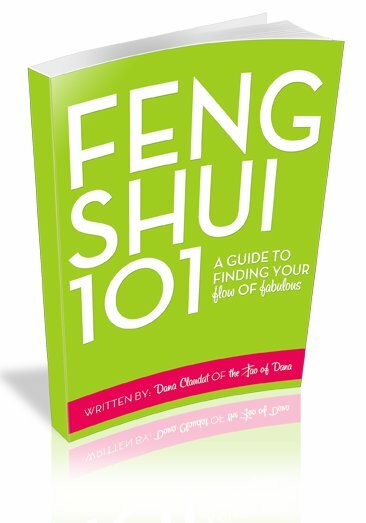 Feng Shui 101 is an entire DIY feng shui consultation laid out in 8-weeks of simple yet powerful steps! Dana Claudat, founder of The Tao of Dana, has distilled her infamously practical feng shui advice, life organization guidelines and holistic goodies into a step-by-step manual to transform the place where you live into a gorgeous home. In the process, you will start to live a life with more openness and flow. You will learn to use simple design tricks and feng shui tools to super-charge your intentions, find your focus, balance your life and live more artfully. Its not just a book: 2 full feng shui classes are hyperlinked inside- in-depth lessons on creativity & goal-setting that will rock your world. Plus more bonus videos and resources. This is not a "put a lucky crystal in a corner" kind of book, this is a book to teach you the art and science of creating your dream home and raising the energy around you in ways that elevate your whole life!